Want to have more freedom during your day this summer without sacrificing the order and predictability a routine brings? 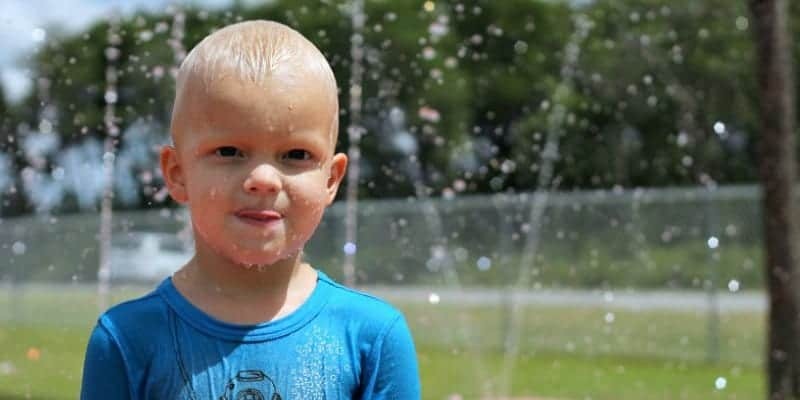 Here are some ideas for a summer schedule for kids. It’s hot here already. Really hot. And when it gets hot everything changes for me. I want to be outside. I want to plant things, mow things, and hit the beach. Since all my children are still small, there are pros and cons to spontaneity. The obvious pros are they get to do different things, stay up later, get up later, go on vacations, and just enjoy the season. The cons are they don’t actually function well without routine. They get fussy after a few days of erratic bedtimes. They start to behave badly and whine more when they don’t know what’s next. Basically… they thrive on routine. 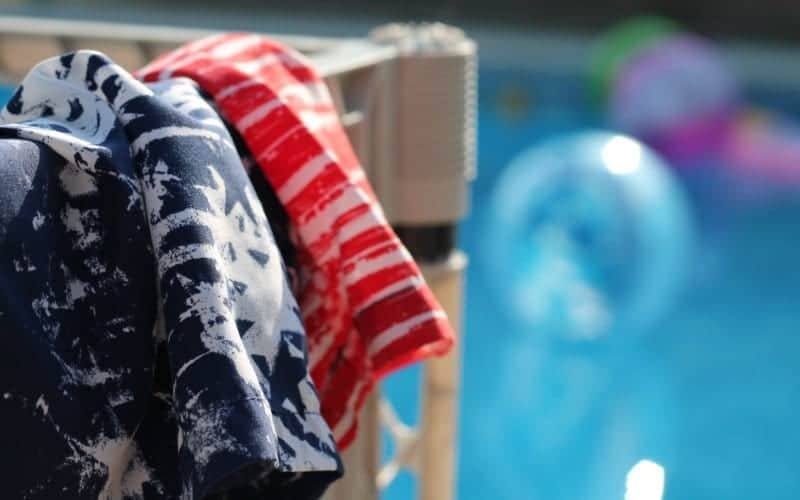 So in an effort to make the most of summer, loosen the reigns, and still maintain the benefits of routine you just have to be a tad more purposeful. Here are some ways to do that. 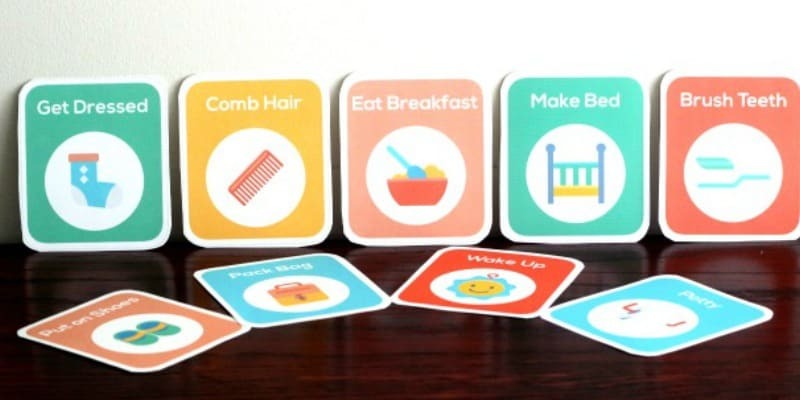 Teach your toddler how to follow their own routine without nagging or reminders using printable routine cards. Go for a week or so and see what changes you’re naturally making. I found we were wanting to swim every day and eat dinner later. So I noticed what we tended to do and began tweaking our routine. Dinner at 6 instead of 5? Okay. Bedtime at 8 instead of 7? As long as they’re sleeping later too, sounds good! Instead of putting kids in their rooms for independent play time closer to lunch, you might move it earlier in the morning so you are free until lunch or afternoon. You don’t have to do what you always did. You can make a new normal for a few months. Just give it a week or two and see what you end up doing during the day, then use that to make a more structured routine. If you create a Pie In The Sky routine out of nowhere you won’t likely keep it. Kids don’t want to go to sleep in the dark. However, if they start staying up later but still get up at the same time you’re going to have cranky kids on your hands. If their sleep routine was 7 pm – 7 am and has changed to 8 pm – 8 am, then that’s awesome! But if it’s changed to 9 pm – 6 am and no set naps because you’re out and about… after a few days this will result in over-tiredness. If your kids can swing it then this may not be an issue, but if your kids are used to consistent naps and bedtimes you’ll want to be sure your routine changes still accommodate adequate sleep. And get black out curtains or shades. 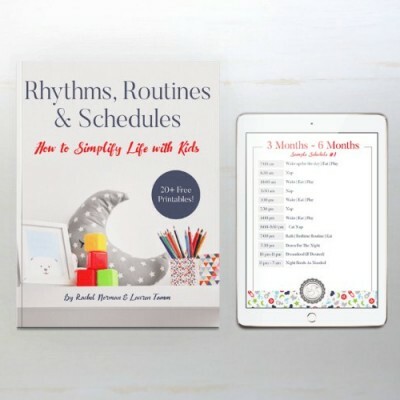 If you move bedtime back for a week and notice the kids are not sleeping any later in the morning or making it up during naptime, weigh whether their behavior is negatively affected. You’ll know if it’s going to work for everyone. I am a summer girl at heart. That means I have tons of things lined up in my head and up my sleeve best done in summer months. Days at the park, beach, and pool can become a new norm in your routine. Your new weekly outings may be the public pool instead of the library or outside play time instead of screen time. Our kids love movie night, but they also like swimming until nearly dark. We may cut out movie night this summer OR even move it outside! Make a summer bucket list. Or do what Emily Ley does and keep track of the fun stuff you do on a whiteboard. That way it’s less pressure! My kids embrace summer wholeheartedly, but they also take sometime adjusting. They get physical exercise throughout the winter and spring, but nothing like they do in the summer. Sun makes us more tired and so does continual exercise so if you’re having a very active or busy summer you may find that a total change in routine takes some adjusting. Change meal times, bedtimes, or activity times gradually and see how your children react. Don’t expect to move into a new season or routine without some hiccups. There will be high emotions and adjustment periods. If you drop most scheduled things in your day, one thing I’d encourage you to work in is independent play time. My kids love having free days and unexpected outings and family time. But if they miss their alone play for a few days in a row it is obvious in their behavior. They hate sharing, fight more, and get possessive over toys. By keeping that alone time in their day they behave more settled and actually get along better. All kids want some time alone when they don’t have to share. Rotate the toys, put each child in a separate room in the house, and voila. You may, however, want to change when they have their own play. You may want to move it to afternoon if they’re physically active in the mornings. You can tweak it to best fit your own family’s schedule. If your child has dropped a nap then rest time counts as a lone time. And it doesn’t matter if one’s in your walk-in closet and the other is outside or wherever. It only matters they are alone, they don’t have to share, and it’s relatively quiet! 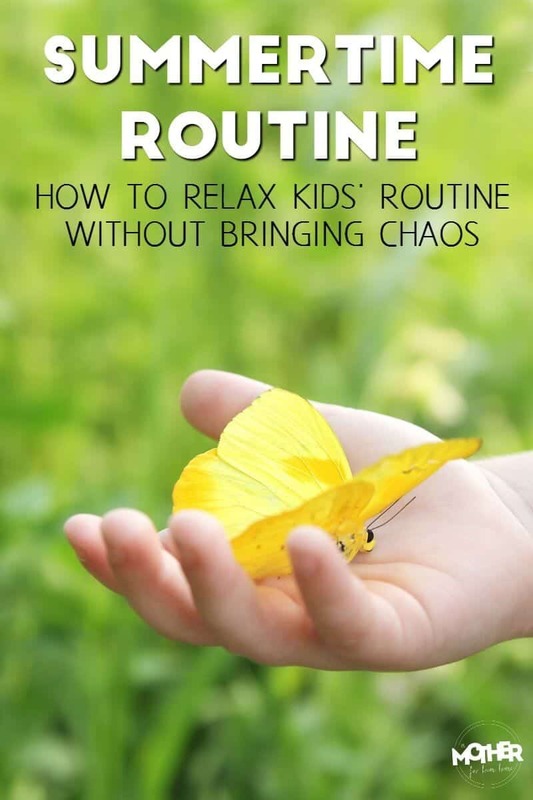 If you’re got exciting days and weeks ahead with fun things planned for your kids, try to space out the tiring days. Elementary aged children and up may be fine, but toddlers and preschoolers won’t cope well with multiple days in a row of out of the ordinary excitement. Four late bedtimes in a row. Three days of no naps. Two days of all day outside. It sounds fun, but the effects will accumulate until you have unhappy campers. It doesn’t mean don’t do fun things, but to consider your kids when you plan big events. These are great suggestions. 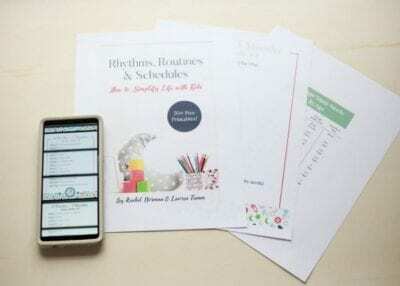 It’s so hard to go from a regimented routine to a more relaxed one. I will definitely be using your advice! I have an 18 month old, a 3 year old and a new 5 year old. My 5 year old daughter is very good at independent play and always has been. My 3 year old son isn’t very good- he will often just sit in his room instead of playing. Sometimes he will look at books but other times, he just waits for me to come back. Sigh. My real question is how do you help your 18 month old to learn it’s play time and not nap time if their independent time is done in their crib? Thanks! Jenni, it’s a tough age because they often fall asleep but I just keep at it until they get it. I will give a great toy or two (that perhaps he doesn’t normally play with) and just keep the time short until he gets it. I really like this list. It’s hard for me to move from our regular schedule to doing something more flexible. This definitely helps, especially with making dinner time later. One thing – in item 2, did you mean that kids don’t like going to sleep in the light, rather than the dark? I ask because of the room darkening suggestion at the end of the paragraph. Thanks for all your tips! They surely have helped me. These are all such fantastic suggestions. 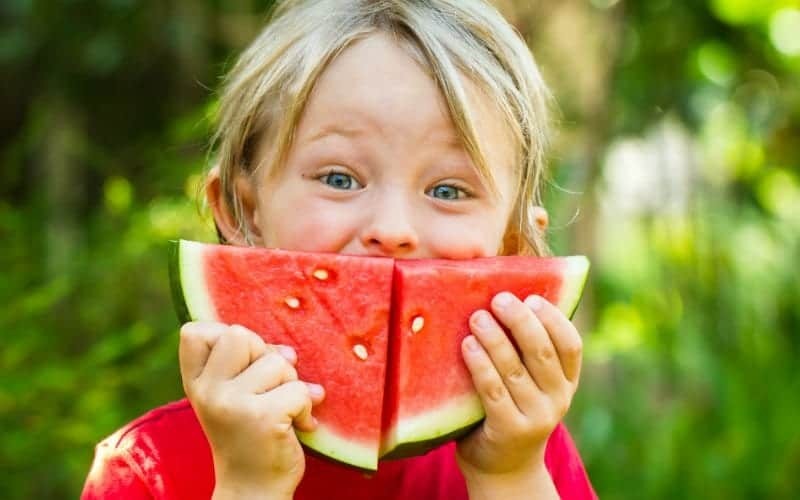 Summer can be a wonderful time but it does take thoughtful transition, and some of the things you mentioned (finding new routine, changing bedtimes but keeping sleep) are so critical to kid’s happiness (and yours!). I really like the idea of alone time. My four year old has recently ended napping yet she is still exhausted some days. I think some alone time could help her recharge. We’ve also found that having a daily focus during the week is helpful to provide some structure, while not being overly scheduled. For example, Monday is visit a park day, Tuesday is have a friend over day, Wednesday we do a craft etc. We’re you at my house last night? I am a teacher and transition into summer is the hardest thing for me. Summer used to mean lazy days but that doesn’t go with a 4, 2 and 5 month old. We actually talked about some of your suggestions last night! Thanks for the post!